-Rabbit a.16, 2014. (Mixed media: ceramic/Small and brown faux pearls/Large sweet water pearls/Pink Jade) ø 9 x 14,5 cm. 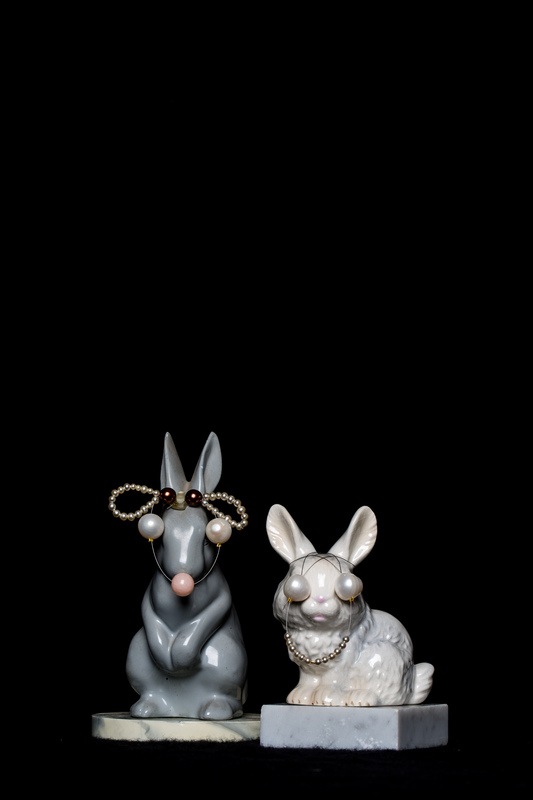 -Rabbit a.12, 2014. (Mixed media: 1970s porcelain signed Goebel/ Small faux pearls/Large sweet water pearls/Marble) 6,5 x 6,5 x 11 cm. These two species; Rabbit a.12 and Rabbit a.16 are created for the same purpose: pioneering digital hearing enhancement technology (DHET). Rabbits are extremely suitable for DHET because of their largest feature: the ears. By blocking the eyes and mouth they won’t see no evil and speak no evil, but they can hear evil extremely well. And that’s where they come in handy. The species is created to double as a propaganda and gossip detectors, next to being cute. Rabbit a.12, on the right, is stuck in an experimental phase: the pearly smile allows making sounds. Rabbit a.16, the last try-out in line, is the most efficient one, but not yet cute enough.